Property Location With a stay at New Victorian Inn & Suites in Omaha (Millard), you&apos;ll be within the region of University of Nebraska-Omaha and Henry Doorly Zoo. 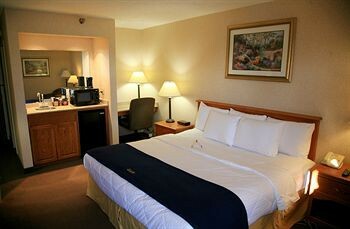 This hotel is within the region of CenturyLink Center Omaha Convention Center and Lauritzen Gardens.Rooms Make yourself at home in one of the 129 air-conditioned rooms featuring refrigerators and flat-screen televisions. Complimentary wireless Internet access keeps you connected, and cable programming is available for your entertainment. Bathrooms have showers and hair dryers. Conveniences include desks and complimentary weekday newspapers, as well as phones with free local calls.Rec, Spa, Premium Amenities Take advantage of recreation opportunities including a fitness center and a seasonal outdoor pool. Additional features include complimentary wireless Internet access and a television in the lobby.Dining A complimentary buffet breakfast is served daily.Business, Other Amenities Featured amenities include complimentary high-speed (wired) Internet access, a 24-hour business center, and a computer station. Planning an event in Omaha? This hotel has facilities measuring 500 square feet (46 square meters), including a meeting room. Free self parking is available onsite.